No roads to cross to enjoy the Gulf. Walk to restaurants, shopping, boat docks, fishing, golf, and amusements. SHORELINE TOWERS is located in the Heart of DESTIN with 2.5 miles of sidewalks for walking and jogging, or bike through the neighborhood streets. Destin has been voted one of the 'Most Beautiful' Beaches in the World! The Gulf of Mexico water is a beautiful emerald blue/green color with the most gorgeous sugar white sand. Walk right out the building... into the courtyard....on to Sugar White Sand Beach....... No Streets to Cross.......we are as close as you can get to the Gulf.... When you walk in our foyer... you see water....While preparing dinner you can watch the boats from our kitchen....Gaze at the Gulf while laying in the king-size master beds....Or watch the dolphins and boats from the Living, Dining room...and Bedrooms. 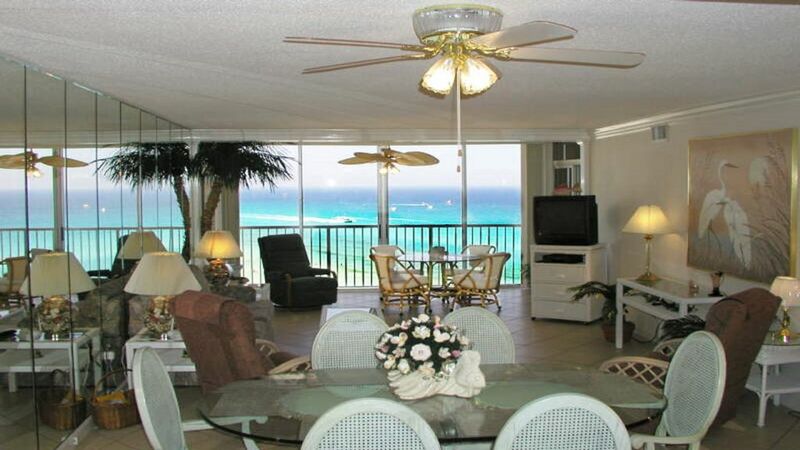 The Views are GORGEOUS from our Destin, Florida condo, please look at all the pictures....they do not do the condo justice! Our Two Master Bedrooms, TWO bath, 1OTH floor unit, sleeps 6... With a VIEW OF GULF and a king size bed in BOTH master bedrooms, Queen-size sleeper sofa in the living room. We have two comfortable Lazyboy Rocker/Recliners to sit back, watch Flat Screen TV and enjoy looking at the Water. a fully-equipped kitchen... Cook in our beautiful White Kitchen with a view of the Gulf of Mexico. Free DSL Wireless Internet, Free Long Distance and we have a outside storage closet has chairs, umbrella's, boogie boards, children's toys and tennis racquets. Our Condo is stocked with books to read, DVD's, VCR's and board games to play on a rainy day. Holiday Isle is a peninsula surrounded by the Gulf of Mexico and Destin Harbor. View sugar white sand and the emerald green waters of the Gulf of Mexico right from your own living room. Shoreline Towers has two lighted tennis courts and shuffle board on the beach. Wonderful exercise facility with sauna. Only a few minutes drive to Destin Harbor... home of Destin's charter fishing fleet, plus sailing excursions, sunset cruises, pleasure boat rentals, diving, and snorkeling trips... Nearby are abundant shopping, outlet stores, antiques, and art. Golf courses and water parks are only a short drive away. PLEASE NOTE - OUR RATES ARE UP TO DATE!!! YOU CAN SEE WATER WHILE COOKING, WHILE YOU EAT. SITTING DOWN ANYWHERE IN THE LIVING ROOM, DINING AREA and BOTH MASTER-SUITE BEDROOMS. (2) Large Master Bedroom has Flat ScreenTV with DVD and comfortable recliner. Telephone, Wireless DSL Internet, Flat Screen Color TV/VCR/DVD in Living Room, Flat Screen TV/DVD in Bedroom, Fully equipped kitchen, Washer dryer in unit, 2 King size beds, 1 Queen size hide-a-bed, BBQ grills on-site, Heated pool, Exercise room, Sauna, Large meeting room with full kitchen for snowbirds, Lighted Tennis and Shuffle Board Courts. SORRY NO PETS AND NO-SMOKING CONDO. SATURDAY TO SATURDAY BOOKINGS ONLY!